Almshouses are a fascinating curiosity left over from an age when the poor and destitute would typically fall through the gaps as universal care as we know it, did not exist. 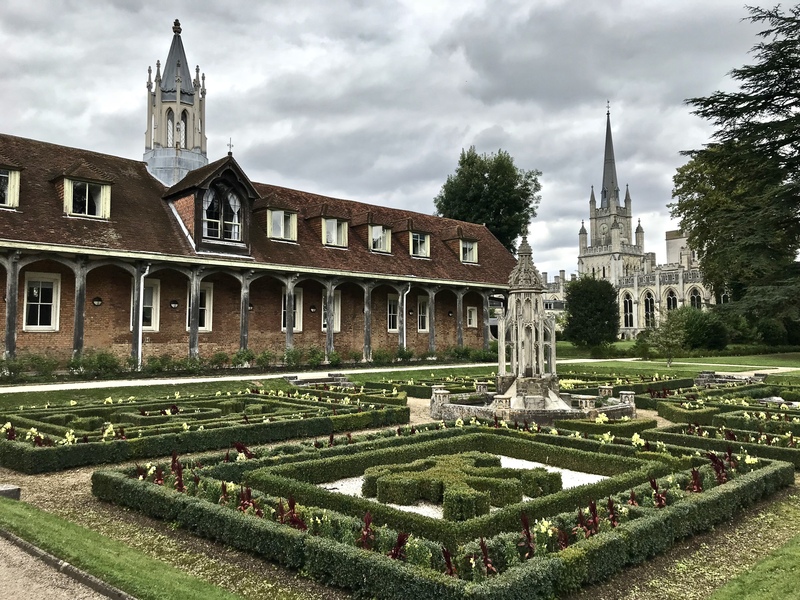 You find almshouses in the centre of busy towns, on high streets, beside churches or tucked away in the corner of a field, the remnants of former communities and their social needs. Typically Georgian in style, there are some Tudor, one Strawberry Hill Gothic, whilst others have had a Victorian makeover, but still include interesting features, elaborate chimneys, often with pretty cottage gardens or courtyards the perfect location for the residents to spend time in. By definition, an almshouse is charitable housing provided to enable people to remain in their own particular community. They are often targeted at the poor, at those from certain forms of previous employment, or their widows, and are generally maintained by a charity or the trustees of a bequest. Originally formed as an extension of the church system, benefactors were not exclusive to this order however, and some where established primarily to ensure safe passage for the benefactors’ souls to make it to heaven. Alms are, in the Christian tradition, money or services donated to support the poor and indigent. The first recorded almshouse was founded in York by King Athelstan; the oldest still in existence is the Hospital of St. Cross in Winchester, dating around 1132. In the Middle Ages, the majority of European hospitals functioned as almshouses and for those established for the benefit of the founder of their family, usually incorporated a chapel. As a result, most were regarded as chantries and were dissolved during the Reformation, under an act of 1547. Residents no longer have to wear special items of clothing, emblems or badges that would signify where they lived, or to remind others of their benefactors’ largesse. Dwellings too have been modernised which has meant that in some instances, fewer residents can be housed with the addition of indoor plumbing for example. An impressive 2,600 almshouses continue to be operated across the UK, providing 30,000 dwellings for 36,000 people. The Chilterns has a wonderful collection of these buildings that are still functioning as charitable associations, housing those in need and below are some that I have visited, and will add to this as I encounter more. Suggestions most welcome! Aylesbury old town centre is a crowded cluster of cottages in just a few narrow, largely car-free streets that surround the churchyard of St Mary the Virgin whose ornate clock tower dominates this skyline. Many of these dwellings are in fact almshouses, administered by the Thomas Hickman Charity. Founded in 1698, the charity works to support the people of Aylesbury and aims to benefit those in a similar state of need; an aim broadly in line with almshouse charity foundations across the country. To say these lanes are a delightful surprise is an understatement! 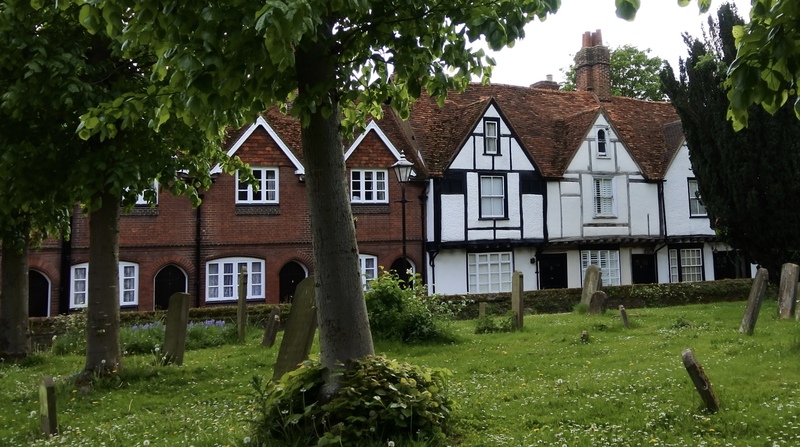 A pretty church square with beautiful trees and lopsided headstones are from another age surrounded by multiple terraced houses or apartments now providing accommodation for small numbers of residents. William and Alice de la Pole were benefactors of the almshouses and school built in 1442. The almshouses were to consist of twelve old men, bachelors, poor and in reduced circumstances, but not from the lowest class of life. Over them was set the thirteenth man, who was to be of a ‘superior type’, a kind of head-brother to the twelve. All were to wear a habit consisting of black tabards or gowns of wool with a red cross upon the breast. Closely incorporated with the church through whose west door leads you into the pretty cloister around which the 14th century almshouses residents now live, which in turn lead into the compact school grounds that makes for a magical medieval complex, complete with their very own Grande Dame of Ewelme. A Grade II Listed Block of 4 almshouses in Ellesborough, formerly eight, dated 1746 Founded in 1720 by the bequest of Dame Isabella Dodd for the maintenance of 4 old men and 4 old women. Over the road form the church, these cottages are now a private home with one of the loveliest of Chilterns views. Lady Dodd made similar bequests in Little Budworth in Cheshire and it is unclear what her connection with Ellesborough was. A Grade II Listed Building, founded in 1624 by the bequest of Thomas Weedon of Pednor, Weedon Almshouses were rebuilt in the late nineteenth century of flint rubble and red brick quoins. The four almshouses with their gables, barge-boards and chimneystacks are rarely properly enjoyed as they sit behind a high flint wall, obscured so an image is not readily available. A Grade II listed property, the Drake’s almshouses were a gift to the market town of Amersham by local bigwig, Sir William Drake who built them in 1657 ‘for the relief of 6 poor widows of good repute in the parish’. Originally six dwellings, they were converted in 1997 to provide increased accommodation and modern conveniences for four residents given them greater comfort. Located on the high street in Berkhamsted, the John Sayer, chief cook to Charles II, bequeathed £1000 in trust “for the building of an almshouse and the purchasing of lands for the relief of the poor widows in Berkhamsted St Peter”. The inscription reads: “The Guift of John Sayer Esq 1684”. 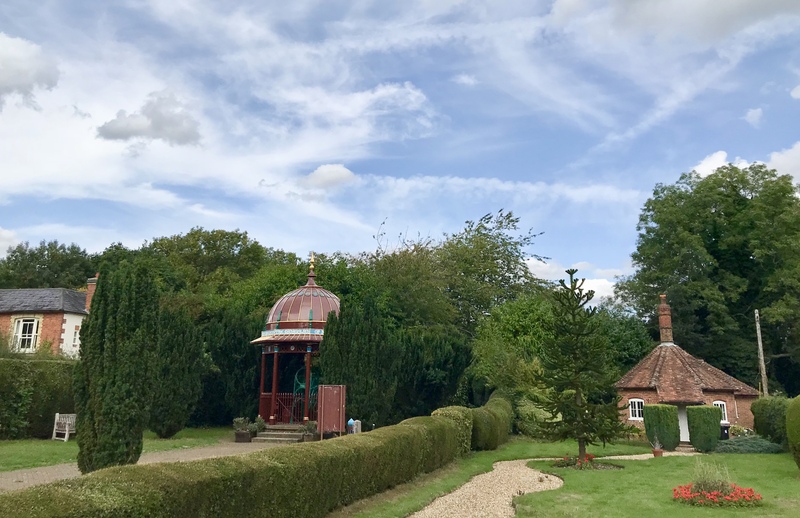 A Grade II Listed Building located on Akeman street in Tring, opposite the quirky Natural History museum, was built to house the retired workman from the Rothschild Estate, an entity that had a huge impact on this quiet market town. This lovely row of tudoresque-styled almshouses was designed by William Huckvale and are quite a local feature, with Nos. 1-5 dated ‘1893’ and Nos. 6-8 dated ‘1901’. 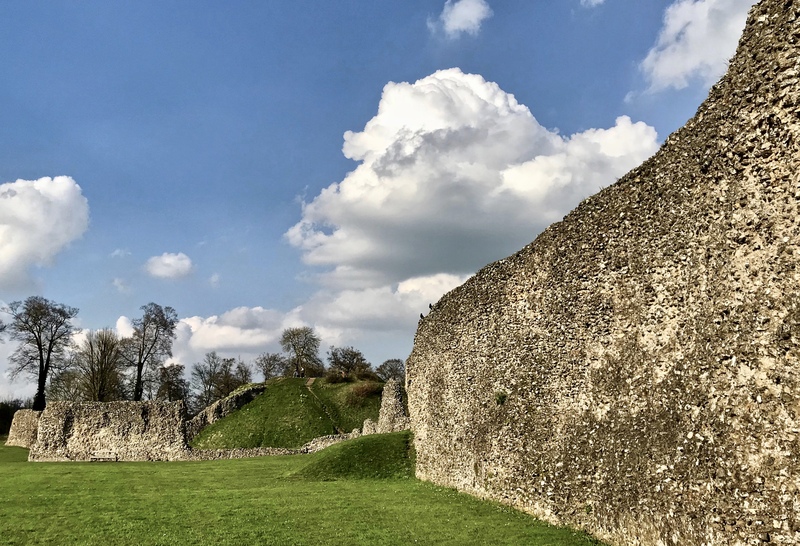 Adventures and inspiration in the naturally outstanding Chilterns. At first drive-through, this busy Buckinghamshire town is not a pretty sight. 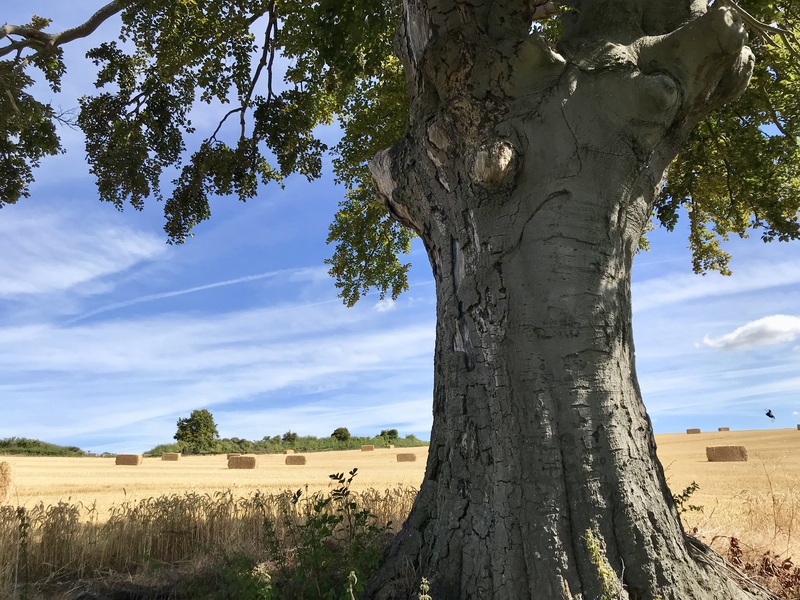 Aylesbury is town that has kept it’s historic heart well and truly hidden, marooned on a little island cut off by busy roads full of traffic rushing through on their way elsewhere. Perhaps you are familiar with Aylesbury because of its association with ducks? Not as obvious is its historic association with the nearby Chilterns as this town played an important role in the English Civil War, very much in support of the Parliamentarians against Charles I and presents one of the most visible links with the Chilterns due to its proximity to Great Hampden, home of John Hampden: his silhouette on the emblem used by the district council and his statue prominent in the market square. A town that has grown too quickly, concrete, traffic and ugly shopping centres are the hazards to be navigated before finding the charming Georgian old town. A way in, is through an easy-to-miss arch that leads from Market Street into the restored 15th medieval coach inn yard of the Kings Head inn, busy serving food and beverages since around 1455 no less. Now owned by the National Trust, the popular Farmers’ Bar within the King’s Head site has been run by the Chiltern Brewery since 2005. Follow the cobbled passageway into the courtyard that dates back to the early 14th century when it was the original busy market square. The enclosure of the quiet courtyard with additional stables to the one at the rear once provided stabling for nearly thirty horses, hard to imagine now. 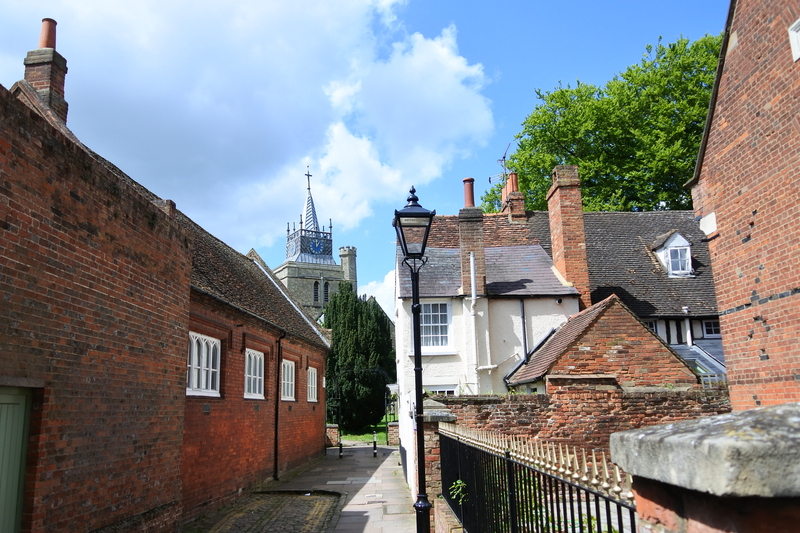 The old town centre is a crowded cluster of cottages in just a few narrow, largely car-free streets that surround the churchyard of St Mary the Virgin whose ornate clock tower dominates this skyline. Many of these dwellings are in fact almshouses, administered by the Thomas Hickman Charity. Founded in 1698, the charity works to support the people of Aylesbury and aims to benefit those in a similar state of need. To say these lanes are a delightful surprise is an understatement! A pretty church square with beautiful trees and lopsided headstones are from another age. These multiple small terraced houses or apartments providing accommodation for small numbers of residents can be found all over England, the Netherlands and Norway. Established from the 10th century, the first recorded almshouse in England was founded in York by King Athelstan with many of the medieval almshouses established with the aim of benefiting the soul of the founder or their family. As a result, most were regarded as chantries (saying prayers for the soul of the benefactor to speed their way to heaven), and were dissolved during the Reformation, under an act of 1547. There have been almshouses in Aylesbury since before the 12th century and the provision for assisting the poor typically came from the church, local hospitals and various private benefactors. By the late 17th century, demand grew, due to increased migration from the countryside that continued to put pressure on the Aylesbury parish. It was during this time, that the Thomas Hickman charity was founded, along with other new almshouses including; the Weeden almshouse in Chesham, the Drake almshouses in Amersham and Lady Dodds cottages in Ellesborough and the even older Ewelme Almshouse Charity in Ewelme amongst others (blog post follows). These simple dwellings provided space for one person to live in a single room – normally as part of group that stipulated how many where intended for men and how many for women, all of whom received an allowance, or pension that could be money and goods, such as kindling. The Thomas Hickman houses did not follow this pattern and you can enjoy the many sizes and styles alongside one another, that reflect that there is unusually no prescribed limit on the number of occupants, normally one per dwelling. It is remarkable that such an old welfare system still survives today, is testament to it’s valued place in building communities and giving recipients independence and dignity with a stimulating and beautiful environment that hasn’t suffered the same fate as the rest of the town. No8. Church Street ‘the Chantry’. Various information signs indicate a trail, but I didn’t follow it. Worth the effort I’d say, once past all the concrete to explore this oasis and I will be popping back to wander these calm streets and visit the Bucks County museum. You can still buy Aylesbury ducks from the last breeder, Richard Waller, whose family has been breeding them since 1745. The Thomas Hickman Charity, A Tercentenary History (author Hugh Hanley) is an interesting accompaniment to this feature. Bucks County Museum is worth a visit and is open throughout the year. To enjoy Chiltern Brewery finest beer and ale, visit the Kings Head pub.